6) Continue on in the same pattern until your bracelet is as long as you need it. Tie off the end and cut leaving about 3 inches past the knot. This will give you plenty of slack to tie the bracelet onto your best bud. -The more strings you add the longer they have to be in order to ensure a long enough bracelet. -Keep your knots tight, this will help make the texture nice and even. -These bracelets tend to twist. You can flatten them out by using an iron on a medium heat setting. -To keep the individual threads of the embroidery floss from separating you can wax them first using a recently lighted candle. Try for a friendship necklace or a belt if you have the patience! 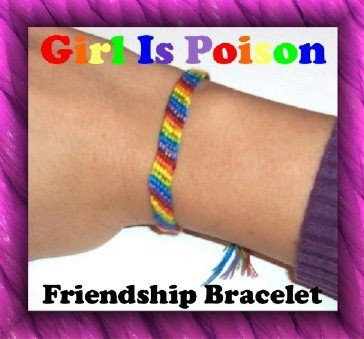 If you can't learn how to make a friendship bracelet, you have problems. Every summer I would make friendship bracelets while "up at the lake" with my cousins. I would wear them until they literally fell off. I recently tried to showing my daughter how to make them. It seems the art of friendship bracelet assembly is lost on her generation.